Setting attendance report relevant information. Click Setting-Time Attendance to open Time Attendance Setting window. Step 1.Time attendance base on Work Time or Duty Function Key, which could select here. the attendance report. Depend On [ Duty Function Key ]: depend on access controller LED. For example: “Duty: 0,Duty: F; OVT: 0, OVT: F” messages. Step 2. Maximum User On System: the number of users. Step 3. Duty Start Time [ Day Shift ]: the time for day shift. Step 4. Update time clock to controller at program start: Synchronize the time of the computer and the controller. Step 5. Auto update Controller Clock: Two time sets to synchronize the time of the computer and the controller automatically. Step 6. Backup Message File: indicating the second folder path to save backup message file. 701Server has been executed. We normally execute 701Client as another program. Step 8. Press Yes button to save all settings. Step 1. Setting AR-881EFV node ID is 001. Step 2. Press “Read From Controller” to receive access controller data. Step 3. Modify the access controller node ID. Step 5. Relay [WG]: lock relay time is the amount of time that the lock will be operated on WG. Step 6. Open too: Lock Relay Time + Door Open Time. Step 7. too: Lock Relay Time + Door Open Time operated on WG. Step 9. Arming: the time between arming mode preapred and arming mode actived,it is buffer time. Step 10.Alarm Delay: abnormality occurs and alarm delay time expires, the alarm will be issued. Step 11.Edit Pwd: the master code is used to access all the programming features (6-igits). Step 12.Arming Pwd:if the controller is in arming mode , they can always detect whether there are anomalies and alerts. There are two ways to set arming mode: 1. Enter program mode 2. Input arming PWD.Master Controller of Network: if there are many networking access controllers, you must set one controller as Master Node. Step 13. Door Nr. : The number corresponds to location to help user identify access record and area. Step 14.Door: the number corresponds to location to help user identify access record and area. Step 16.Enable Antipassback: when two readers are used to control Entrance/Exit, anti-pass back may be set. Step 17.Enable Push to Exit: through RTE to open the door. Step 18.Enable Auto Relock: When door colesd,lock will auto-lock. Step 19.Close Stop Alarm: The activated alarm will be stopped when the door is closed. Step 20. Share Door Relay: Only use one door. Step 21.Enable Free Zone(63): 701Clien zone63 for auto open time (refer to ). Step 22.Free Zone Open lmm. : Enable Free Zone to open door. Step 23.Ena. Disarm Zone(62): The Disarm Zone’s activated alarm will be stopped. Step 25.Skip PIN Check: AR-881E does not have keyboard ,when you log in can skip enter PIN code. Step 26.Door open for any Tag: The same frequency, any card can open the door. emergencies, reset function of anti-pass back. Step 28.Alarming if Expiried: When the user-card is overdue,alarming will working. Step 29.WG Output Mode: Setting AR-881E become output mode to connect other controller. 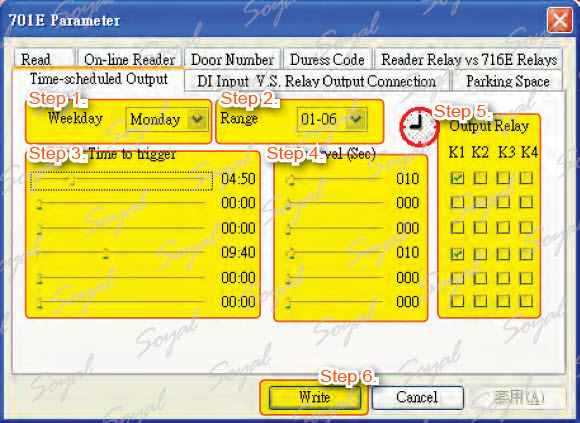 Step 30.Auto Open Zone: setting relay output for open the door, specify the weekday. General be used in office and auto managemet. Step 31.Time Schedule Alarm: there is a time-scheduled output . Setting relay output, specify the weekday, time. General be used in office and auto management. Step 32.RS-485 Port: select external equipment. Step 33.Biometric Module Type: select external equipment. Step 34.Write Fingerprint / Vein: download fingerprint data to access controller (select user adderss to be download). Step 35.Delete Fingerprint / Vein: delete AR-821EF/V’s fingerprint or finger vein data (select user adderss to be deleted). Step 36.Read Fingerprint / Vein from controller: saving fingerprint or finger vein data from access controller to the computer (select user adderss to be uploaded). Step 37.Write: Write all settings to access controller. 8 series access controller is an advanced access controller , most of the parameters need to set via 701Server. Click to open 821E/829E Parameter setting window. Step 1. AR-829E is with LCD panel access controller, enter program mode and input 31 (quick instructions) to set node ID. Setting AR-829E node ID is 001. Step 4. Lock relay time: lock relay time is the amount of time that the lock will be operated. Step 5. Alarm Relay Time: alarm relay time alarm continuous transmitter time. Step 6. Lock Relay Time + Door Open Time. Step 7. Arming Delay Time: the time between arming mode preapred and arming mode actived, it is buffer time. Step 8. Alarm Delay Time: abnormality occurs and alarm delay time expires, the alarm will be issued. The main objective is to reduce false triggering. Step 9. 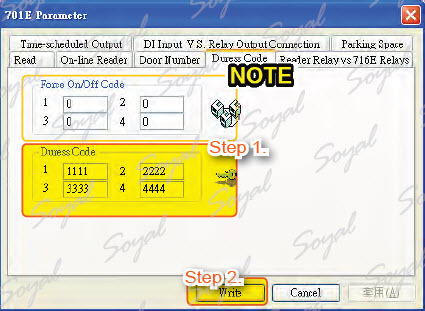 Master Code: the master code is used to access all the programming features (6-digits). Step 10.Arming PWD:if the controller is in arming mode , they can always detect whether there are anomalies and alerts. There are two ways to set arming mode: 1. Enter program mode 2. Input arming PWD. Step 11.Door Number: the number corresponds to location to help user identify access record and area. Step 12.Master Controller of Network: if there are many networking access controllers, you must set one controller as Master Node. Step 13. English Menu: Change to English interface, this feature could be also set in the controller. Step 14.Force Open Alarm Output :The alarm will be activated when someone tries to open the door abnormally. Step 16.Auto Re-lock: If the door close then the door lock will relock, using door contact to detect the status of door. Step 17.Auto Open (Zone: 63): 701Clien zone63 for auto open time (refer to ). Step 18.Auto Enable Arming Mode (Zone: 62): 701Clien zone62 for auto arming (refer to ). Step 20. Time Attendance Reader: integration of the access record of access controller’s memory for the attendance report. Step 21.Auto Duty Functions: access controller LED will display “Duty: 0, Duty: F; OVT: 0, OVT: F” message. Step 22.Close Door Stop Alarm: The activated alarm will be stopped when the door is closed. Step 23.Enable Anti-Pass Back: when two readers are used to control Entrance/Exit,anti-pass back may be set. Step 24.WG Port Use Alarm Relay: external WG reader to control dual doors. Must Use alarm output as Wiegand reader output. Step 25. Max Error Times: determine the allowable number of input errors, if the number of input errors exceeds this max error times, keyboard panel will be locked (if max erro time is 0, this function will be disabled). Step 26.Msg. Overflow: The access controller will save the data temporary during offline. There will be alarmed if the capacity of data exceeds Msg. Overflow and remind administrator to save the data into the computer. Step 27.Duress Code: if you meet abnormal person to threaten open the door, you can input duress code and send message to control center. Step 28.Daily Time Schedule: there is a time-scheduled output of AR-716E for using, setting relay output, specify the weekday, time. General be used in office and auto management. Step 29.On Alarm for Expiry: if The alarm will be activated if someone presents invalid card to the reader. Step 30.Reset Anti-pass (Zone: 61): zone 61 be used in reset when the user violations and emergencies, reset function of anti-pass back. Step 31.DI Loop 2/3 Show Message: if AR-829E DI is received signal can according to the demand this signal displayed on the computer screen. 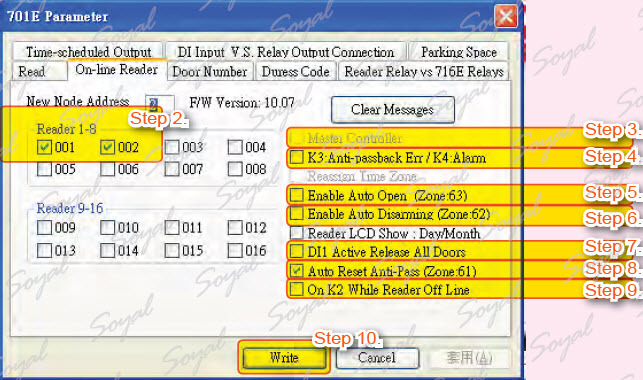 Step 32.Idle Screen: enter message in idle screen, this message will be displayed on access controller LCD panel. Step 33.Open Door via P.I.N. Selection: select access mode. Serial Num + PIN: input user address and private PIN and press # PIN Only: Input private PIN directly (there are no control mode inAR-829E). Step 34.External Reader Format: select external reader format. 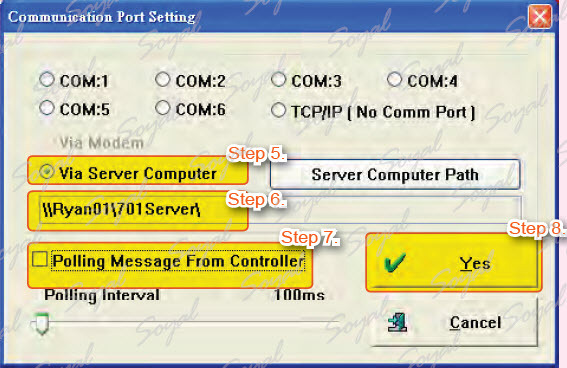 Step 35.TP1 Serial Port Format: select external equipment. Step 36.Download: download fingerprint data to access controller (select user adderss to be download). Step 37.Delete: delete AR-821EF/V’s fingerprint or finger vein data (select user adderss to be deleted). Step 38.Upload from Device to File: saving fingerprint or finger vein data from access controller to the computer (select user adderss to be uploaded). Step 39.Write To Controller: Write all settings to access controller. Select user adderss to upload and download fingerprint or finger vein data. Only when AR-716E (Multi-Door Networking Controller) connected with PC then could entry 701parameters. There are two ways to open the 701E Parameter window: Setting – Controller Parameters and . Step 1.There is filled in AR-716E node ID to get in 716E parameter for others setting. Step 2. There are two channels of AR-716E, each channel could connected with 8 sets of readers. AR-721H is the first access controller and node ID is 001, AR-727H is the second access controller and node ID is 002. Step 3. If there are many networking access controllers, important access controller can be set for master reader of network. Step 4. Select OnK3 is used in users violation of anti-pass back or OnK4 is used in alarm output. Step 5. Enable auto open time zone, this function be set in zone 63 . Step 6. Enable auto enter arming mode, this function be set in zone 62 . Step 7. DI1 will be responsible for receiving the emergency message and open all the doors. Step 8. Reset is used when the user violations and emergencies, reset function of anti- pass back, this function be set in zone 61 . Step 9. K2 will be responsible for receiving the disconnected message message and sending messages to administrator. Step 10. Press Write button to save all settings. The number corresponds to location to help user identify access record and area. Node ID corresponds to access controller to help PC identify access controller and data. Step 1. 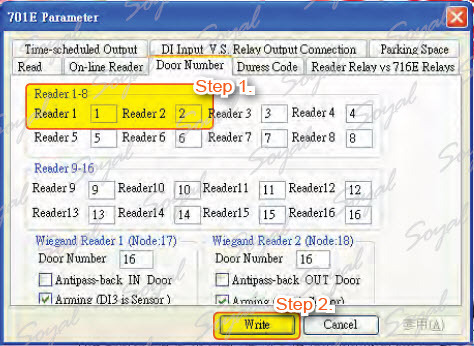 Select Door Number tag and enter of the controller corresponding the door number, reader 1’s door number is 1, reader 2’s door number is 2. Step 2. Press Write button to save all settings. There are two WG channels of AR-716E, each channel could connected with 1 WG access reader. 2. DI3 and DI4 has sensor function. If you meet abnormal person to threaten open the door, for assistance you can input duress code and send message to control center. Step 1. Enter up to 4 sets duress code, for example:1111, 2222, 3333, 4444. Setting duress code in the 701E Parameter is the main duress code. ※ Force On/Off Code be used to control relay. There are 4 relay of AR-716E, K1 to K4, which action time could be set here. The extensive relay board, EXK1 to EX-K8, which action time also could be set. Step 1. Select the node ID and name of relay. Here, we will synchronize the node 001 with K-1 and synchronize the node 002 with K-2. There is a time-scheduled output of AR-716E for using, setting relay output, specify the weekday, time. General be used in office and auto managemet. Step 1. Select Monday for time-scheduled. Step 2. Determine to display how much data, once can be displayed 6 document data. Step 3. Determine alarm time, for example: 04:50am and 09:40am. Step 4. Select the alarm duration: 10 sec. Step 5. Select relay for alarm output. Step 6. Press Write button to save all settings. Using the AR-716E’s DI control relay and request to exit (RTE). Step 1. Selection the number of DI and the corresponding access controller. For example: DI1 corresponding node ID is node ID 1 (AR-721H), DI2 corresponding node ID is node ID 2 (AR-727H). Step 2. Selection the number of DI and the corresponding relay. For example: DI1 corresponding relay is K1, DI2 corresponding relay is K2. Step 3. Input lock relay time: K1 and K2 lock relay time are 10 seconds. Step 4. Press Write button to save all settings. 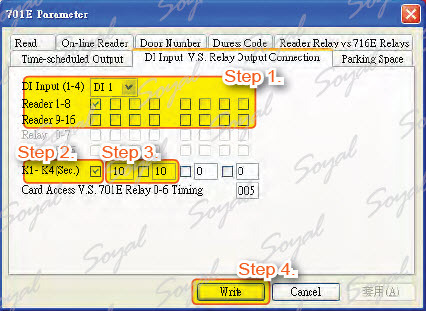 If you do not perform Step 2, lock relay time will be by the same as lock relay time on access controller. This application for parking lots, which could monitor the parking space status and message output to designate devices. Check the connection status of the device when related equipment is wiring complete. First, make sure the COM Port as following – My Computer-Properties-Hardware-Device Manager-Ports. From the above chart shows that port is COM3. Step 1. 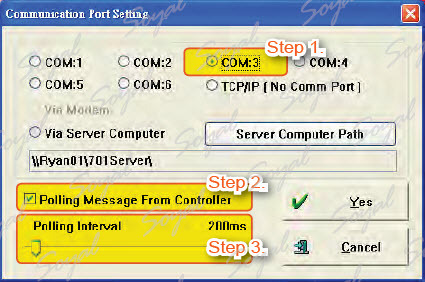 By the computer Detection results to select the port: COM3 (refer to My Computer-Properties- Hardware-Device Manager-Ports). Step 2. Selection the options: Polling Message From Controller. Step 3. Polling Interval: 200ms, the PC will inquiry messages from controller every 200ms. 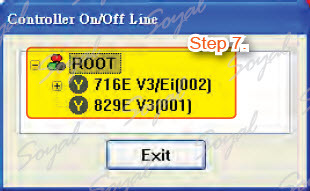 In Node Number for Polling window only for AR-829E and AR-716E be set, because AR-727H and AR-721H which connected under Multi-Door Networking Controller (AR-716E), must enter to set parameters. Step 7. 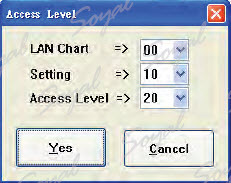 Click to check the access controller item No and amount of access controller. If the icon front of item No is that mean controller successfully connected to PC and find the 701Server icon right at the bottom of taskbar and flashing. Well: controller successfully connected to PC. Not connected well: it recommended to check the followings and must see to do the further settings. 2.Check if the number of settings are correct. Node ID: Access controller with a different code to help computer identify (node ID range: 001~254). AR-716E node ID: 002, AR-721H node ID: 001, AR-727H node ID: 002, AR-829E node ID: 001. Input master code (default: *123456#) to enter program mode and input 00*001# to set AR-721H node ID, AR-721H connect under the Multi-Door Networking Controller (AR-716E), therefore, AR-721H Node ID under the control of Multi-Door Networking Controller (AR-716E). 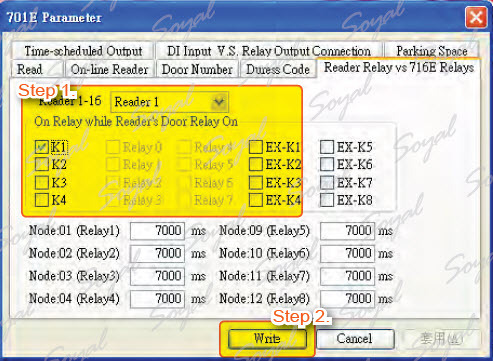 ● The node ID arrangement of readers which connected under Multi-Door Networking Controller (AR- 716E) only could be 1-16. 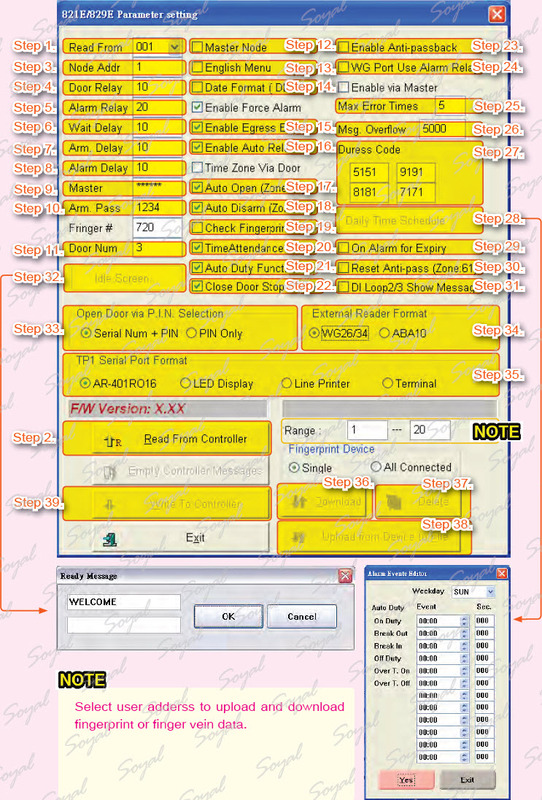 ● Through software (701Server or VisualProx) settings door number. 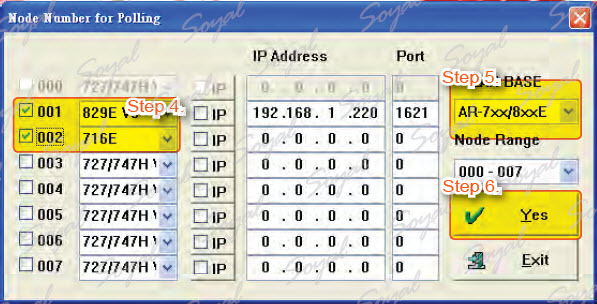 ● Access controller connect with PC directly that node ID range is 001~254. To get familiar with 701Server by the following exmple. A company has three doors: front door, back door and the warehouse. Using Multi-Door Networking Controller (AR-716E) connect two access controllers (AR-721H and AR-727H) responsible for front door and back door , AR-829E independently responsible for the warehouse. Operator access level compared with permission to operate the software in order to determine the user’s permission to operate the software. 1. LAN Chart: 00~63. This level is the permission to view the connectivity, 63 is the highest authority. 2. Setting: 00~63. This level is the permission to modify data, 63 is the highest authority. 3. Access Level: 00~63. 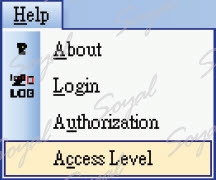 This level is the permission to modify software permissions, 63 is the highest authority. The first time to login 701Client, Login Name and password both are supervisor. Password: supervisor To improve security, change your password and access level immediately after login. Help -Password and then Modify User Access Password window will come out. Items can be modified as follows: 1. User ID: 00-99 for adding the amount of user. 2. User Level: 0-63 access level for editing. 3. 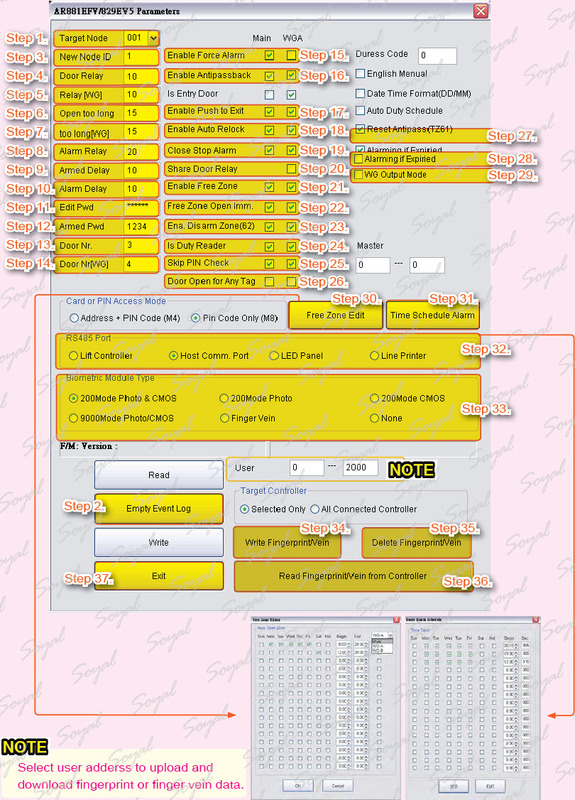 Login Name: login name can have up to a total of 18 English words or 9 Chinese characters. 4. 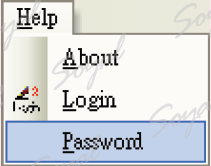 Password: password can have up to a total of 18 English words or 9 Chinese characters. 5. Option at right of window can be changed based on demand. Temporarily leave the 701Client work area ,701Client will pop-up re-login window ,you can based on the following settings avoid re-login window appears and to improve efficiency: Next time you login 701Client use nologin to avoid re-login window appears. 5. Option at right of window can be changed based on demand.